The new thermal wind tunnel from OMEGA is designed to give a highly accurate and uniform flow rate. Four powerful DC fans are precisely controlled to provide variable air speeds from 0 to 1000 ft/min. The WT-2000 wind tunnel was designed to provide thermal characterization of circuit boards, heat sinks and components. The unit is made of clear polycarbonate and PVC for a durable and transparent assembly. 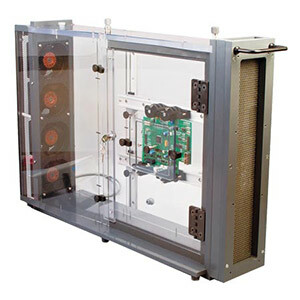 The large test section is accessed by the large hinged door and accommodates a removable test plate, as well as a rail system that allows for a wide range of mounting options. In addition, there is a small access door that accommodates the quick changing of smaller components and the placement of sensors. Multiple access ports with 1/4 and 1/2 " compression fittings are provided on the top and rear panel of the wind tunnel for the routing of wires and insertion of sensors. *All specifications measurements at ambient room temperature of 22.2°C (70°F) with less than 80% relative humidity and 760 mm (29.92") of Hg barometric pressure. Power cord for all countries (stripped ends) 250 Vac max. 참고: Comes with fully assembled wind tunnel test chamber, electronic control box controller fan control cable, PC interface cable, molded power cord (for US, Canada, and Mexico), complete operator'’s manual, and PC interface software CD.